Google’s Android operating system for handheld is making waves, but within the tech circle. Despite providing some pretty interesting features as far as the level of integration with various Google services, it lacks the level of popularity enjoyed by other similar operating systems, such as Symbian and Windows Mobile. But then, its potential is very impressive, given the fact that it can be easily deployed to run on x86 systems. Are you one of the geeks who craves to have a feel of the Android, without actually purchasing a Android based device? If you answer Yes, you have an opportunity to do so. Proving their on-going commitment for developing Android, Google has released a Live CD with the latest Android version designed to run on any PC, regardless of the particular operating systems running on the system currently. Please make a note that Live CD is aimed at developers, who actually create apps for this operating system. It is not a full fledged Operating System and normal users won’t benefit too much from it, apart from the possibility to have a feel of the Google-based OS. Option 1 For Beginners: Burning your Live CD. This one is for the beginners as it is very easy to do. You will have to burn the Android OS Image onto a CD and then boot through it. Step 1 – Head to Live Android Web Page and Download the two parts of the Live CD .ISO file. Step 2 – Join the two parts using an application like HJSplit. Step 3 – Next, Burn the .iso image to a Blank CD. Step 4 – Restart your computer and have CD/DVD Drive place ahead of HDD in list of Boot Devices by making necessary changes in the BIOS. Step 5 – Simply stand by and relax while it loads. Voila! Now you have the Google Android operating system running in front of you. 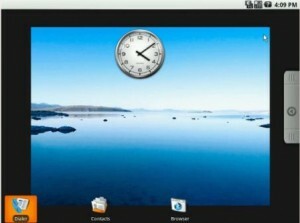 Option 2 For Experts: Running the Android OS on a virtual machine on your computer. This method is a bit difficult, but a lot more rewarding as it will allow you to run your other applications at the same time as the Android and requires no restarting. Step 3 – Get a Virtual Machine Application (like Sun Virtual Box) and install it on your existing Operating System. Step 4 – Install an optical drive software emulator (like Daemon Tools) in order to get the Live CD running within the Virtual Machine. (This is not required for some Virtual Machines like Sun Virtual Box, though others might require). Step 5 – Then Mount the Live CD image into the Optical Drive Emulator. Step 6 – Using the Virtual Machine software, create a new virtual machine with at least 256MB of RAM and a couple of hundreds of MB HDD space. Step 7 – Withing the Virtual Machine software, select the virtual drive on which the Live CD image is mounted as the boot drive. Step 8 – Launch the Virtual Machine. Now the virtual machine should start and you will be able to access the Android OS, in a fairly reduced version restricted to only the shell. You have a feel of the OS now starting from the first screen you’ll encounter and up to the settings and features. Great tutorial dude. I will try this one straight away.